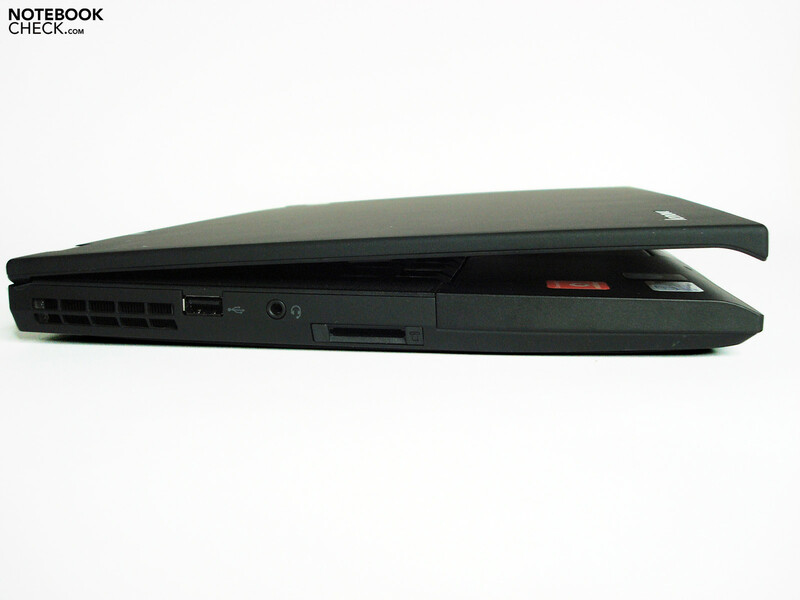 Lenovo promises high performance packed in an ultra-light 14" notebook with its ThinkPad T400s. However, the low test weight of 1.75 kg isn't supposed to make compromises in view of the known ThinkPad quality or in the supply of equipment. If the slim business notebook can fulfill the high demands of corporate clients will be clarified in the following test. 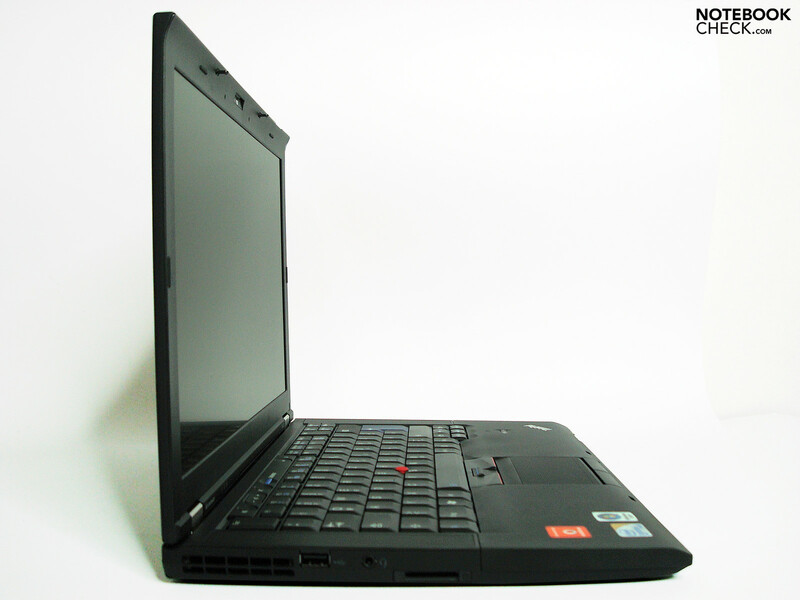 The product portfolio of the ThinkPad models has been expanded since Lenovo took over the notebook division of IBM, among others. Aside from the numerous configurations of the well-known T, R and X series, new display sizes (wide screen, 13" and 17"), as well as entirely new product lines such as the W and SL series, have been launched. 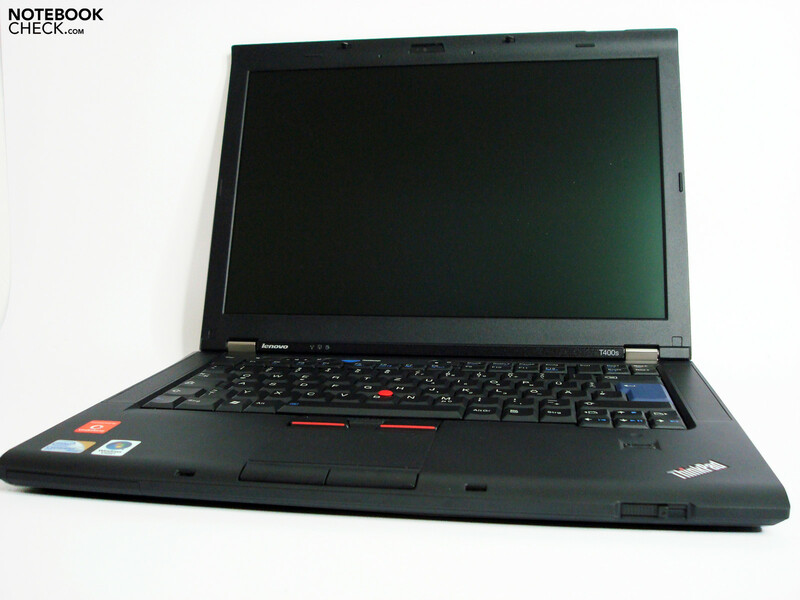 Already available since a few weeks, the ThinkPad T400s is, in a positive way, a reduced variant of the known T400 series and bids a lot of things that many ThinkPad users may have secretly desired for a long time. Aside from the low construction height and the achieved slimline characteristic, the weight reduced by about 500 g (depending on configuration) is the most obvious external argument for the high-end alternative. The price starts at around 1500 Euros, but for our prototype T400s (NSF3TGE), you have to budget a street price of around 1800 Euros. 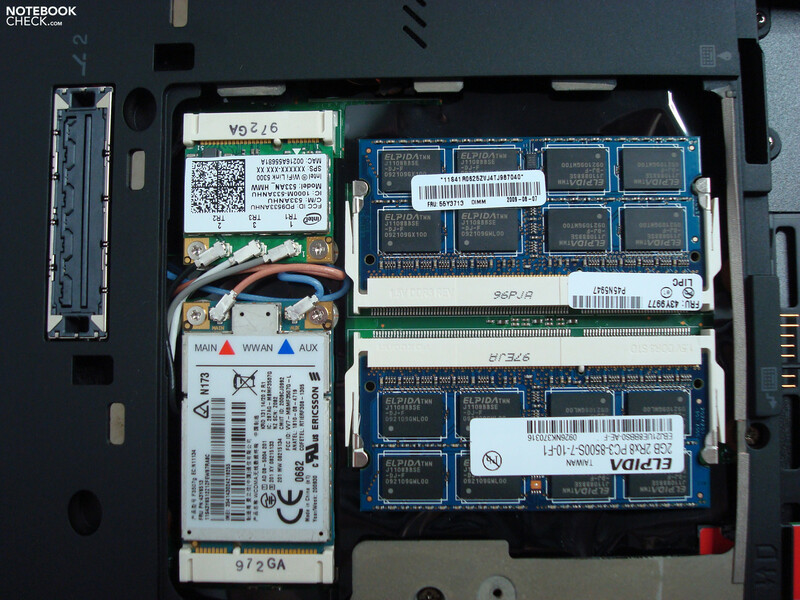 With a 128 GB SSD from Samsung, an Intel Core 2 Duo SP 9600 CPU, a 4 GB DDR3 RAM, UMTS, 36 month manufacturer warranty and Vista Business, just to name the most important core components, you get quite a bit for your money. Apart from that, Lenovo has configurations with conventional hard disks (80GB, 120GB or 250GB), 80 GB SSD, BluRay drive, Vista Ultimate, various RAM alternatives, Intel Core Duo SP9400 and, as usual, the one or other back to school special in its array. There is also already a variant with a multi-touchscreen listed on the US-American Lenovo homepage, which will also definitely find its fans. The case doesn't let any doubt of heritage come up at unpacking. 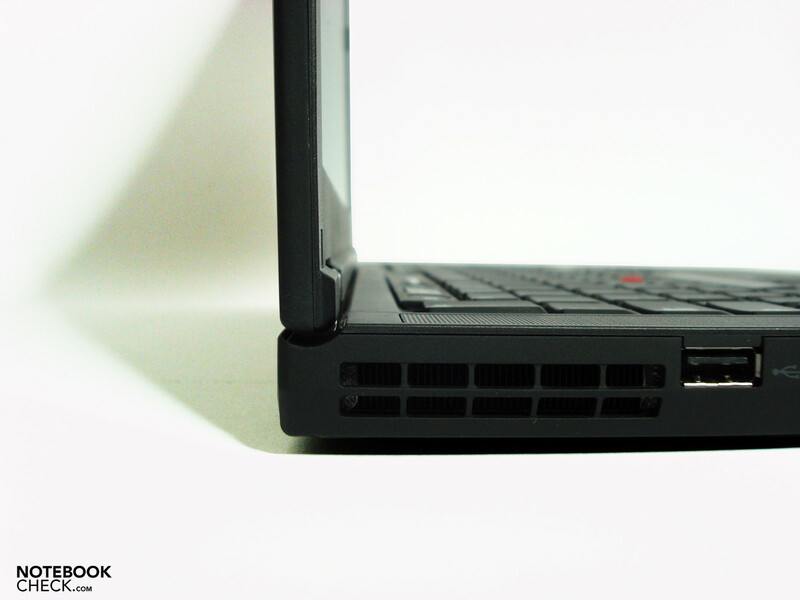 The finely roughened, gray-black surface lacking ornaments and high-gloss fulfills the expectations and already suggests in its debut a solid robustness: Simply a real ThinkPad. 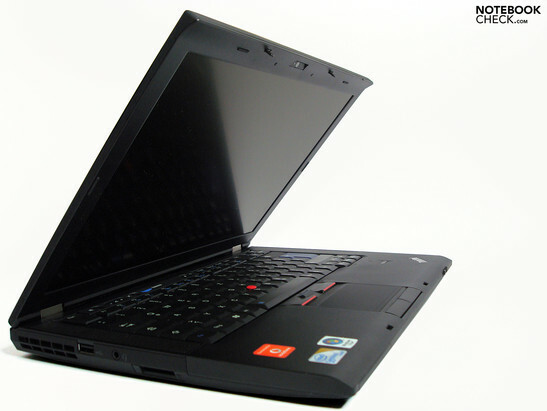 That what the look promises is only broken by the slightly flexible display lid, which could be executed extremely thin due to the LED backlight, but can't reach the stability of the bigger T400 sister models despite carbon fiber reinforcement. There shouldn't be any restrictions of the protective function though, and we couldn't provoke any image distortions at twisting or pressing in the lid, either. 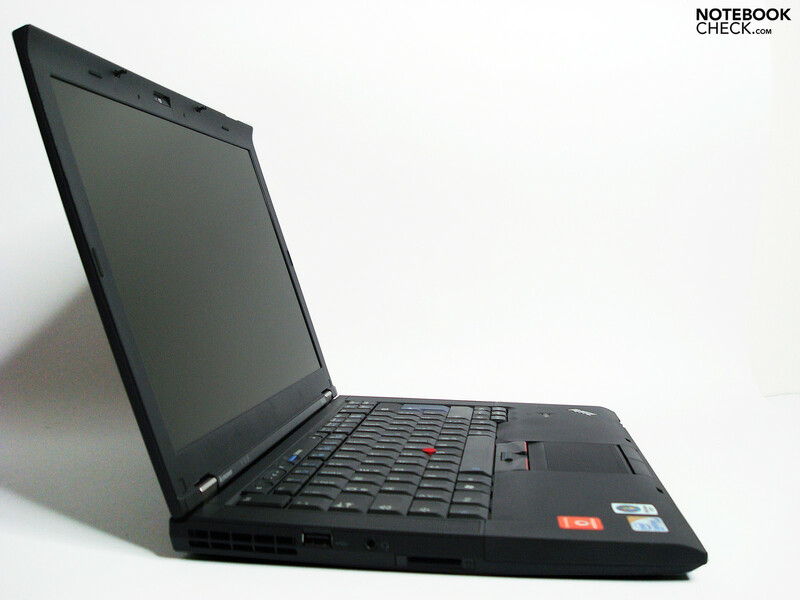 In return, the T400s sparkles with its very low weight of 1750 g, including the optical drive, and underbids many a 12" notebook with that. 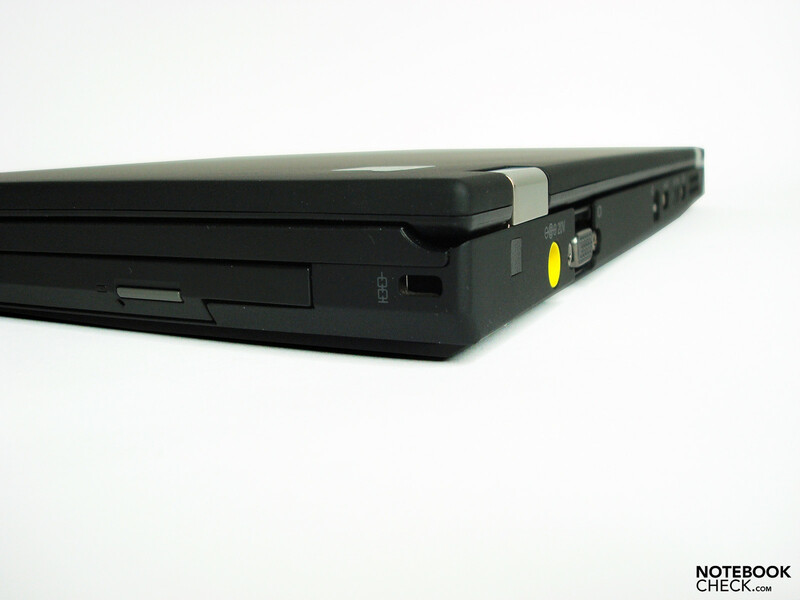 For example, the previously tested 13" Acer Travelmate 8371, which demonstrates big business ambitions, had a test weight of 1.71 kg - without a DVD drive. The chassis shows itself without err or flaw in the stability evaluation. 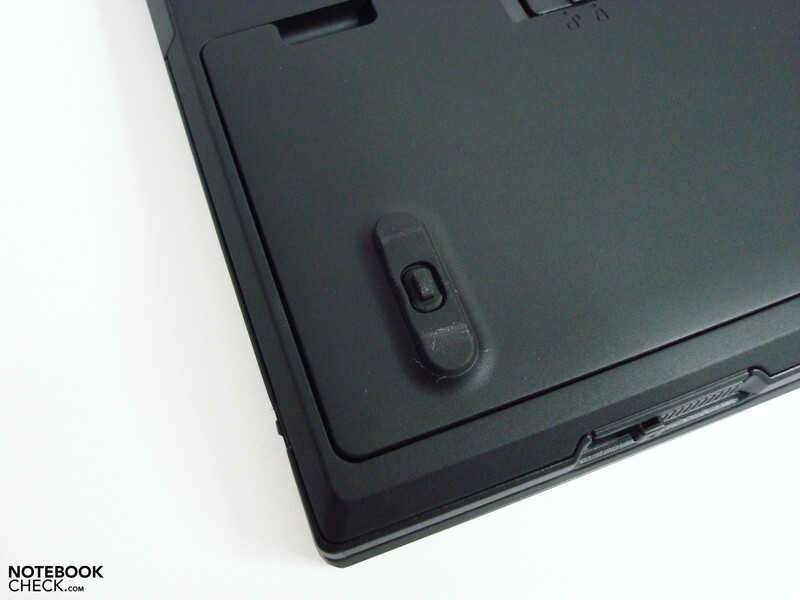 Palm rests as hard as a rock, a high torsional stiffness of the case, very even and exact executed gaps, cleanly fitted buttons and switches, exemplary display hinges and a tight sitting battery are traits that ThinkPad connoisseurs see as a matter of course in the meantime. 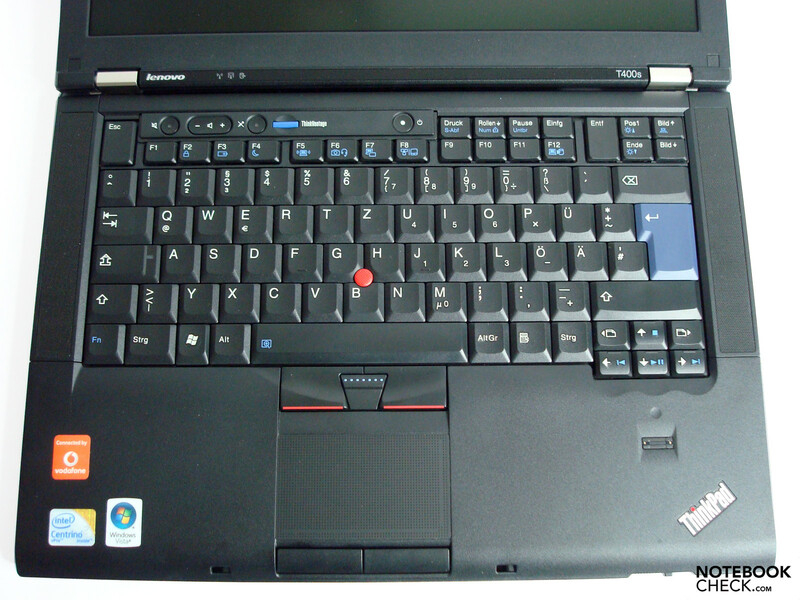 The keyboard's stability still reaches a very good, even if not quite the same level of some predecessor series, such as the T61 for instance, as it yields here and there. This doesn't seem to be an idiosyncrasy of our prototype because this development can be observed in the one or other current T series models. 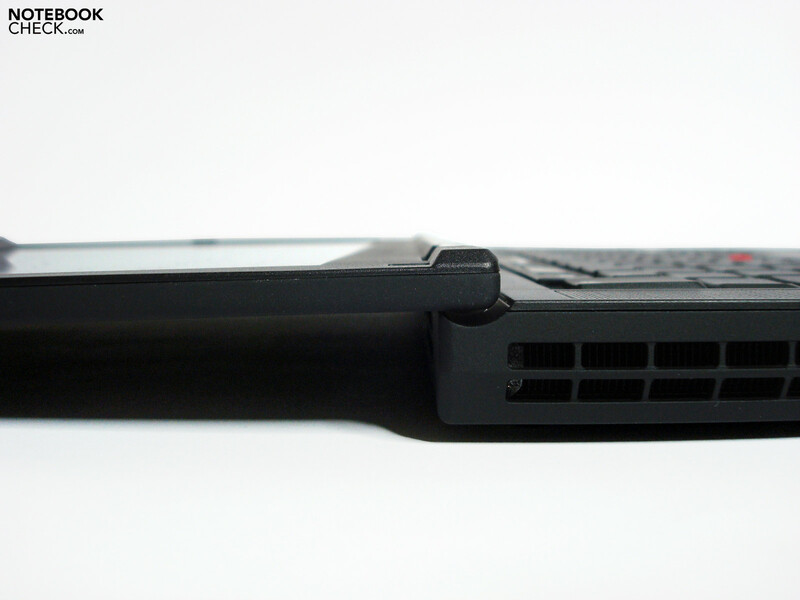 A supporting foot is missing when the battery is removed and leads to teetering at the front right. 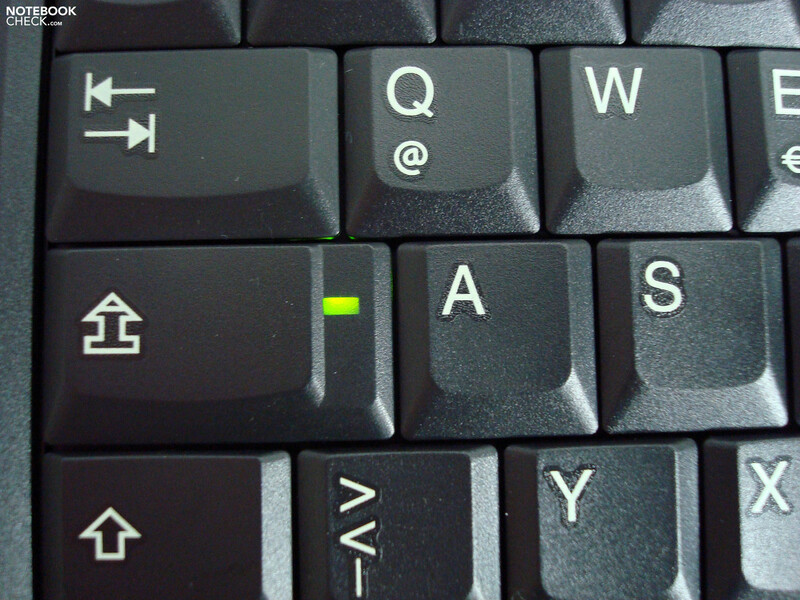 Typing is then only executable for die-hards or a short use. The lithium-ion battery integrated at the front side turns out advantageous for opening the display single-handedly. This adds the necessary counterweight on the front in interaction with the hinges allowing for an easy and comfortable opening and closing without lifting the case. Otherwise, the bottom side presents itself, as usual, with an opening for access to the most important components as quite neat and accommodates several unlocking slides. The usual case stiffness is also found here and doesn't have anything to be criticized. The actually only approx. 2.5 cm high case is lifted to about 6 mm of height by solid rubber feet, which additionally provide for a good air circulation on the bottom side. Unlocking the multibay module hasn't been quite as elegantly solved as in many other forerunners. The notebook has to be lifted for this and it can then only first be removed by pressing two unlocking slides at the same time. 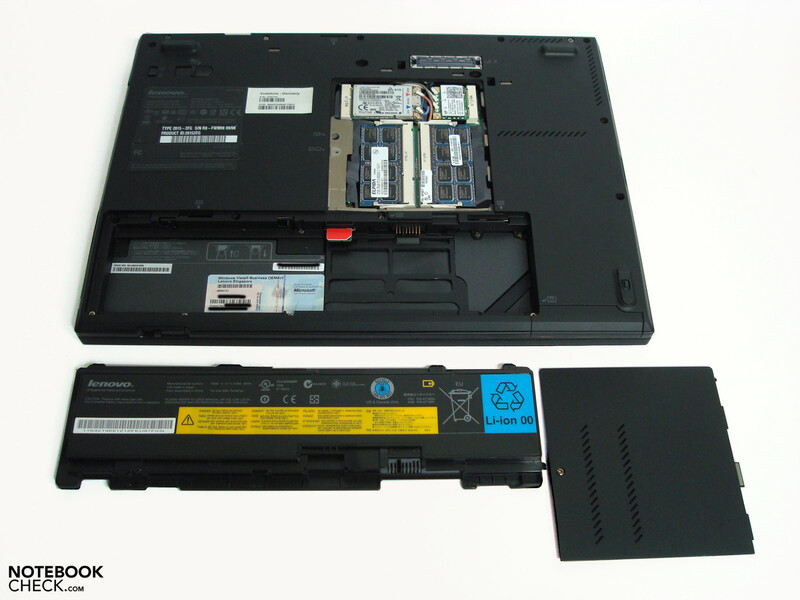 A fast, single-handed changing of different modules is therefore not possible and this will not be appreciated by many ThinkPad pros. The T400s doesn't have every conceivable interface, but has a good mix of type and supply. 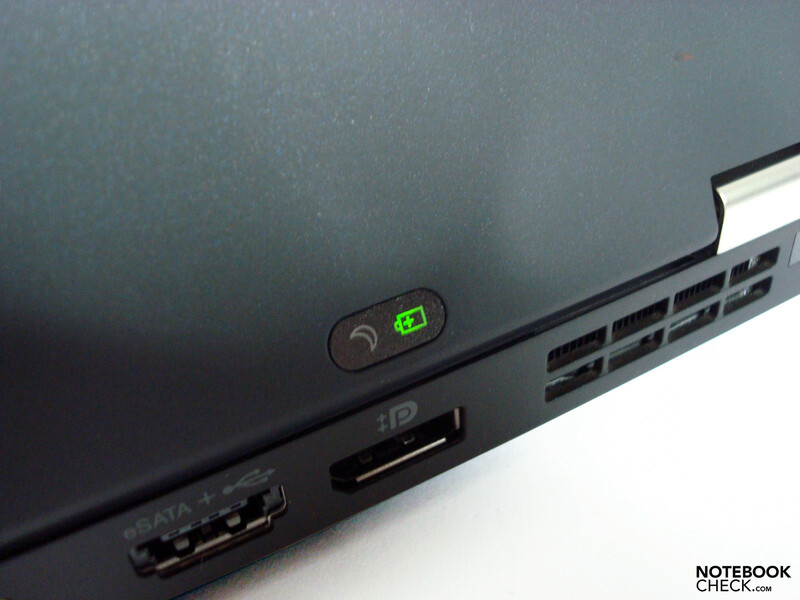 Thus, aside from the usual USB ports for various peripherals, such as printers, digital cameras, etc., there is also a combined USB/eSATA connection. This suggests itself especially for connecting external hard disk drives due to its high achievable transfer rates. However, video fans will miss the omitted Firewire interface badly, which would have been desirable especially for further use of already existent devices. 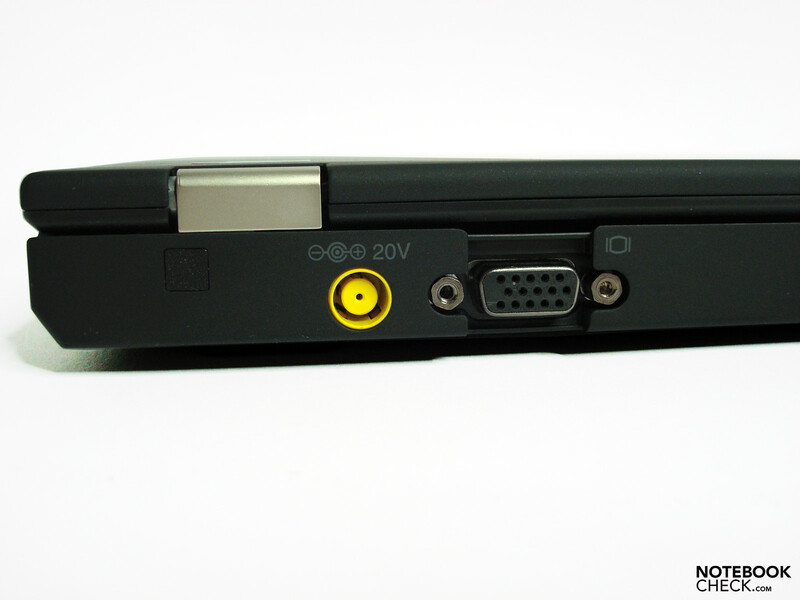 Equipping these standards via ExpressCard also isn't possible in all alternatives, because the ThinkPad T400s is delivered either with a cardreader or an ExpressCard/34 slot. As this isn't always really visible by many retailers, the exact configuration should be verified at interest before buying, in any case. Besides the existing analog VGA-out, a further highlight is the fitting with a DisplayPort, which allows the digital connection of external displays. That's good because the analog signal quality of the VGA connection wasn't any longer impressive at the standard resolution of 1280x1024. The unfocused, almost blurry presentation allows for only a short period of "enjoyment", at most. The business bolide has everything that you might desire, in view of wireless components. Aside from the usual WLAN configuration in draft-N standard, the notebook also has Bluetooth 2.1+EDR and a fast HSPA-UMTS modem, which theoretically achieves 7.2 MB/s in downlink and 2 MB/s in uplink. The real achievable data rates will be rather majorly affected by mobile providers, grid development and signal quality. A test SIM card from Vodafone is included in the scope of delivery. You don't have to fear a SIM or Net lock, as a test run with a, for example, Fonic SIM (O2 net) worked perfectly. 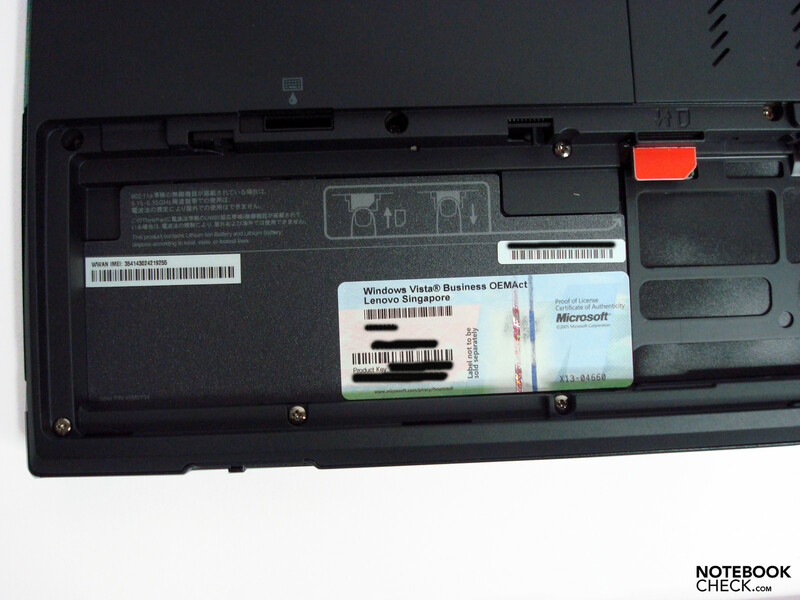 The SIM card slot is found in the battery compartment and is therefore a bit awkward to access for multicard users, when fast changes belong to daily business. This won't bother anyone else, though. Typical business details, such as a Trusted Platform module, fingerprint scanner or password options, provide the security. We found the connection distribution well solved, which is found majorly in the back because the battery is inserted in the front. This has a small inconvenience when it comes to connecting or disconnecting things, but rewards with an almost cable-free work surrounding around the input area. 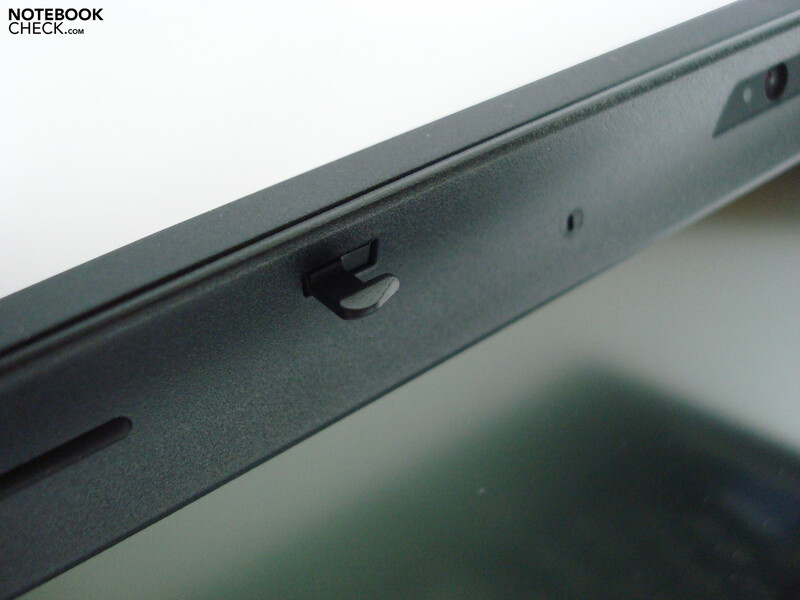 The big bonus of the ThinkPad extension options are the docking connection and the Ultrabay module slot, in which the optical drive is standardly found. 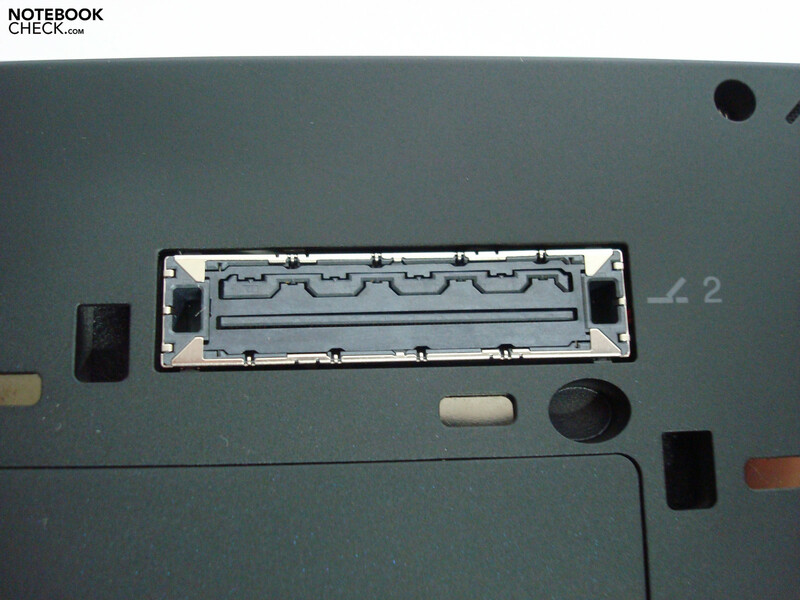 We have mainly found newer docking possibilities of the 3 series as a compatible docking extension for the T400s. Older models probably won't fit anymore. Therefore, in view of the vast amount of supplementary products, you should also inform yourself at the retailer in order to prevent a bad buy before purchasing. 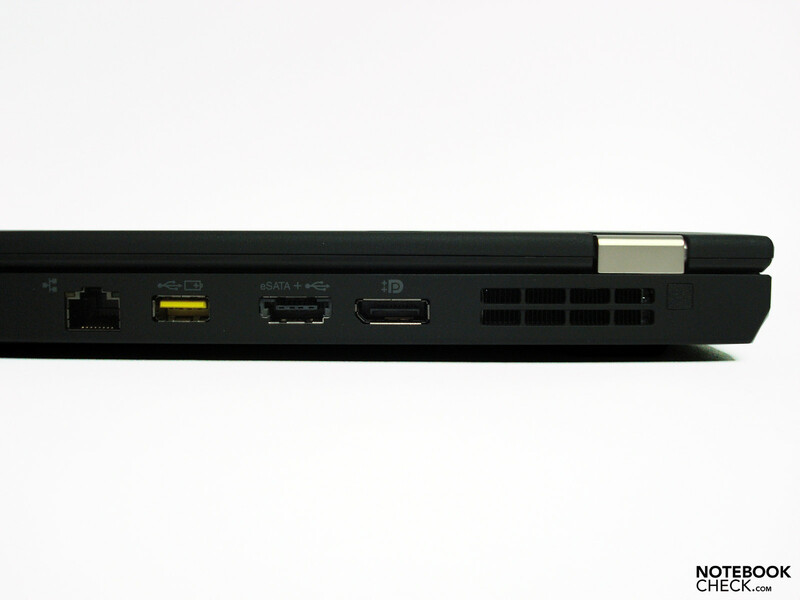 We have found the ThinkPad Portreplicator 3 (433610W, ca.120 Euros), the ThinkPad Minidock 3 Plus (45N6693, ca. 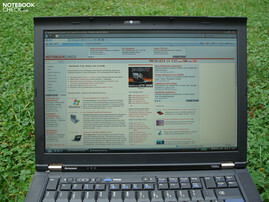 230 Euros) and the ThinkPad Minidock 3 (45N56678, ca. 200 Euros) for the T400s. There is also the Lenovo USB 2.0 Enhanced Portreplicator (43R8771, ca. 100 Euros) as an USB alternative. At the moment, there is one hard disk adapter (43N3412, ca. 60 Euros) for the multibay slot and a 3 cell battery (43R9250, ca. 120 Euros); a BluRay drive should soon be available. In our opinion, the available display port DVI adapter (45J7915, ca. 30 Euros) and the external battery charger (40Y7625, ca.120 Euros) are worth mentioning in the framework of the vast supply options. 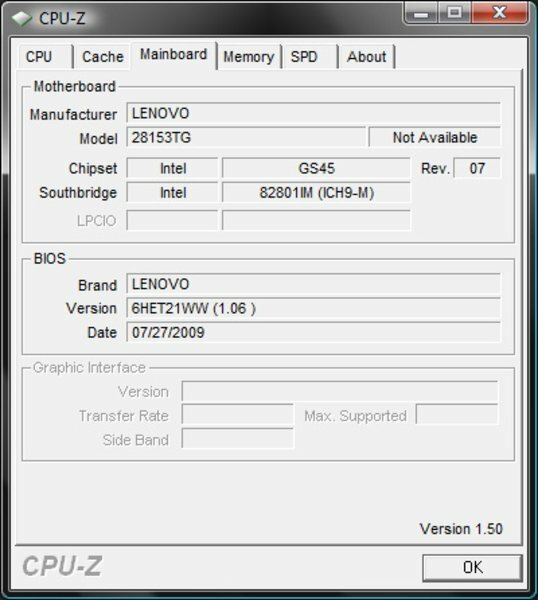 In view of software, Lenovo trusts on Windows Vista Business 32 bit for the prototype, which leaves a part of the RAM unused, and the typical ThinkPad helpers. 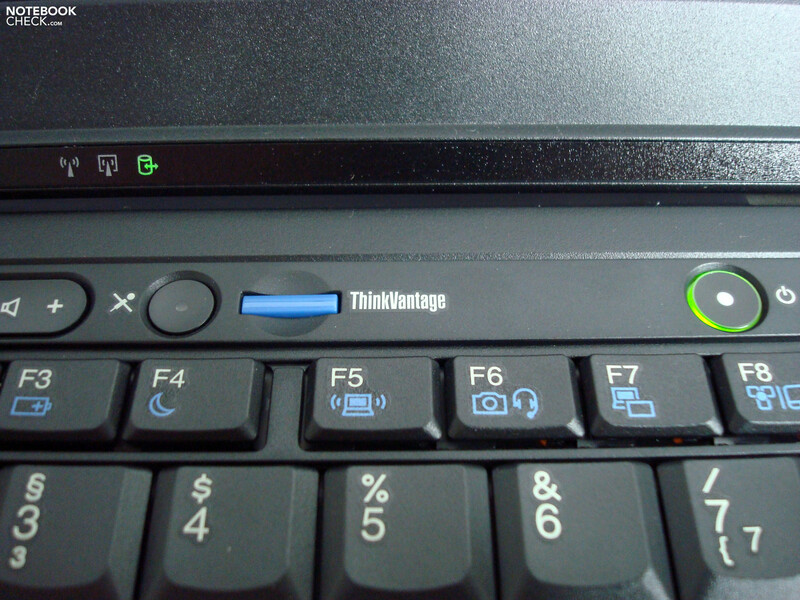 The T400s' keyboard basically falls back on the usual ThinkPad layout and should therefore please most "veterans" as well as newbies. 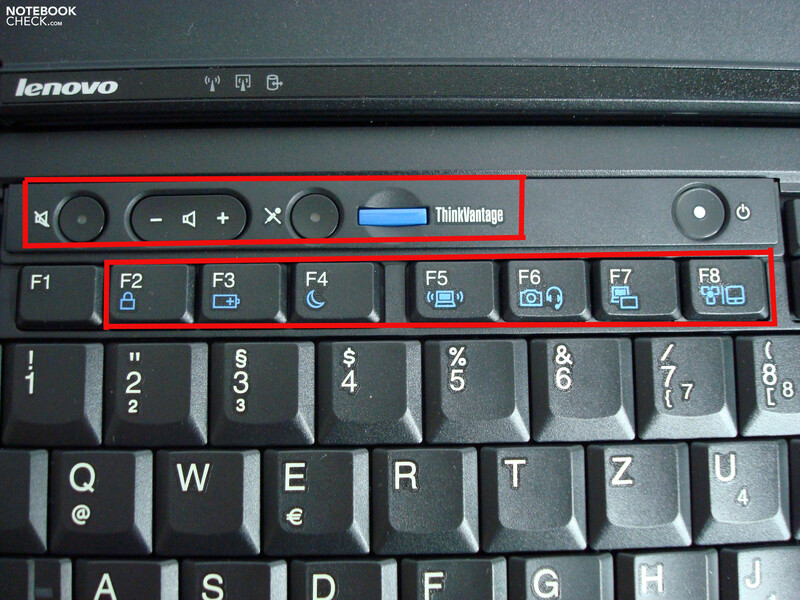 Quick access to basic functions is accomplished over the hotkeys arranged above the keyboard or via the well-known FN combinations, which now also have a video-telephony key to activate webcam and microphone at the same time. 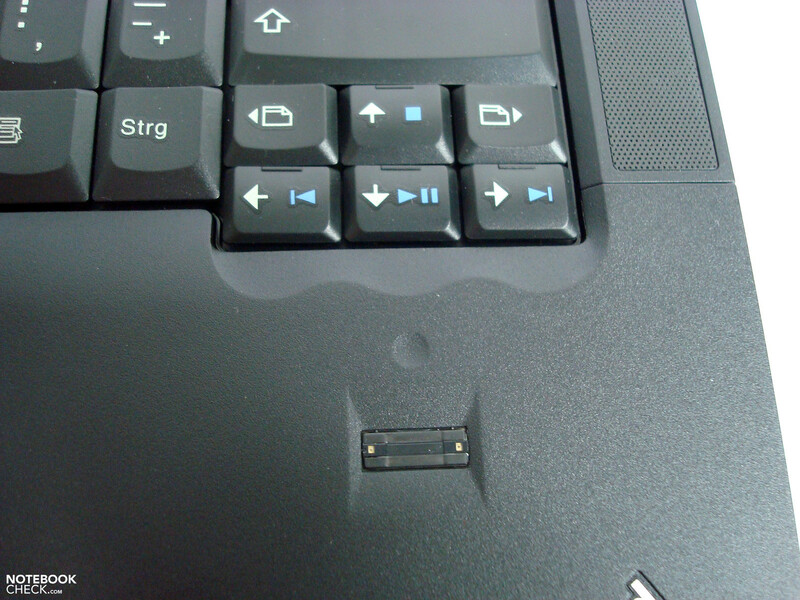 The distance between the keys has now been reduced to prevent infiltration by foreign objects in the sub tray and the Esc and Del keys are twice the size, jutting up to the keyboard edge. 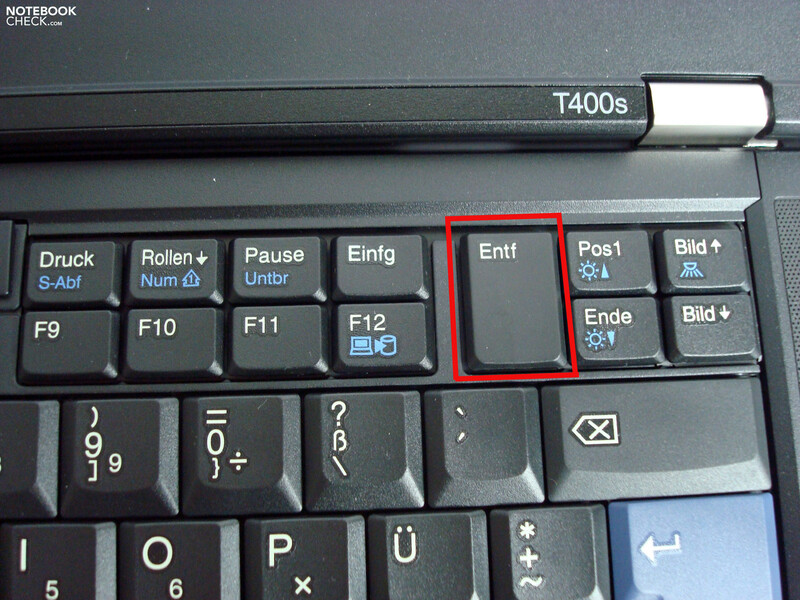 As usual, newbies have to get used to the FN key placed left beside the Crtl key, which leads to wrong input in the accommodation period. An agreeable key stroke, medium stroke length and distinctive sound as other traits should please and convince even frequent typists. As already mentioned the stability doesn't quite reach the level of some predecessors, which is noticeable through a slight keyboard deflection, especially towards the edges and particularly in the left upper edge there. The aberrant, slightly clattery, presumptuous noise characteristic of the space bar is also striking and doesn't exactly convey a high quality impression. However, it works perfectly. 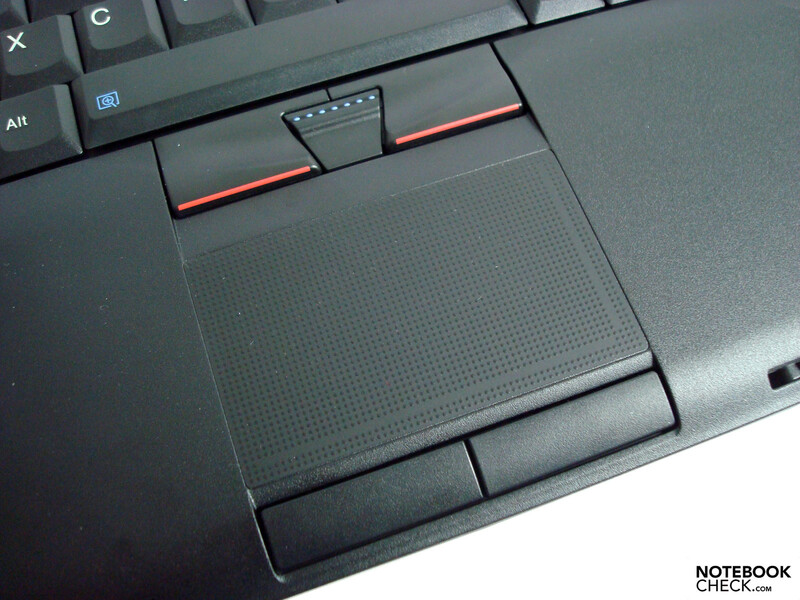 The touchpad is placed on the same level as the palm rests and is demarked by a knobby surface. This is perceived quickly as being pleasant at normal input work and allows for an unerring navigation. The knobs prove to be contra-productive when it comes to multi-touch inputs. Multi-finger inputs, like zooming, scrolling, etc. are thwarted because this requires a certain gliding capability. These are then rather more craggy than smooth. 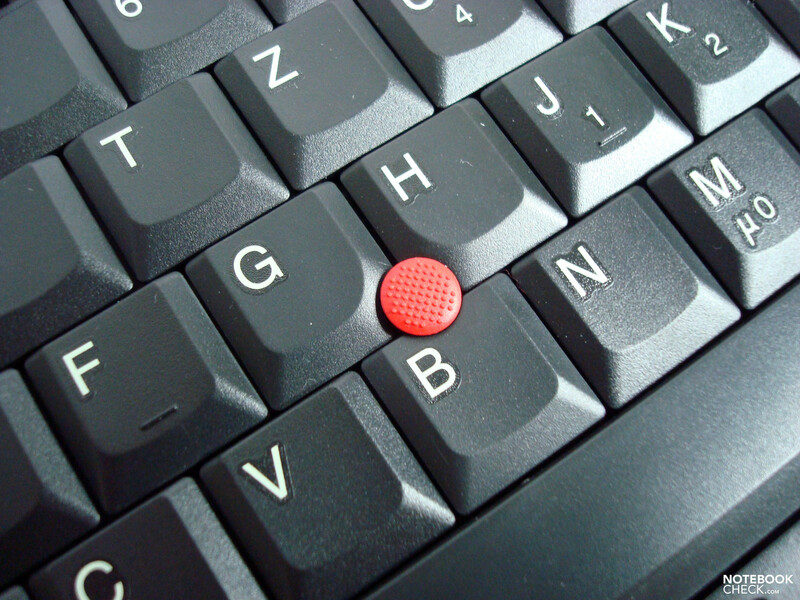 It's said: "Who has once gotten used to a trackpoint, won't ever want to do without". And actually, the cursor is moved flawlessly and fast after a short accommodation period. 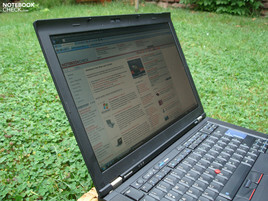 It is especially a good space-saving alternative to a touchpad on the go when space is scarce. It's your choice... Therefore, it is up to individual preferences, which option is selected. The potential user can't complain about not having enough options in the T400s. 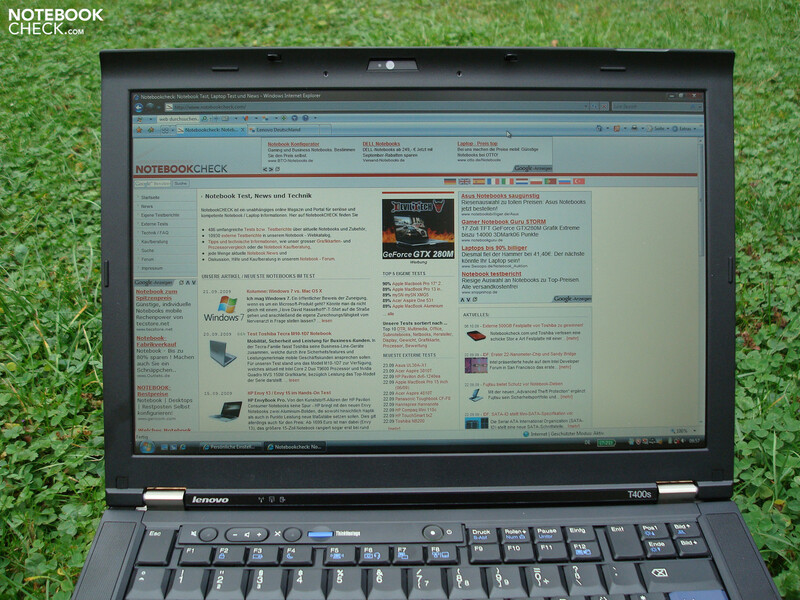 The Lenovo T400s uses an unreflective 14" WXGA+ LED display with 1440x900 pixels, which accordingly has the still well-known 16:10 format. The symbol representation is still sufficiently large with a density of around 120 dpi. This resolution shows itself beneficial already after a short time in an opulent desktop size and more detailed image and movie representation, in comparison to the usual WXGA resolution. The built-in panel has a maximum brightness of 297 cd/m2 in the upper left edge and overall good results with averagely 256 cd/m2. A brightness distribution differing partly up to 70 cd/m2 results, however, in an average illumination of 76% at most for LED circumstances. Normally, this isn't obvious at "ordinary" use; merely with uni-colored backgrounds can a cloud formation be seen. 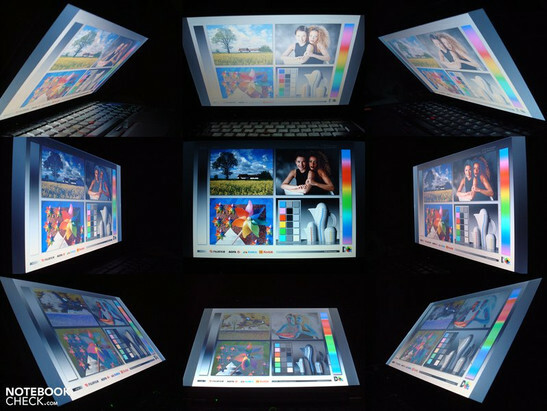 The maximum brightness is limited to 246 cd/m2 in battery mode, which is still enough in combination with a matt display surface in order to also be used outdoors. Very striking is the high black value of 2.88 cd/m2, which leads to an extremely meager 98:1 contrast ratio. The user can neither expect fresh colors nor a saturated black. The gray and very bright black is very obvious. This doesn't lead to any restrictions for normal word processing and browser software; however, the pastel-like, milky color representation will go against the grain of movie and picture fans. A higher contrast ratio could still also improve the readability of text document or website contents outdoors, which is, as already mentioned, balanced by the high display brightness. The contrast-poor representation is reinforced especially by changes of vertical viewing angles from above, as they lead to an increasing bleaching. In opposition, viewing angles from the lower field intensify the colors, but they invert quickly, too. It looks better in the horizontal viewing angle stability area. The image contents can be recognized for a long time and merely a slight color and brightness change has to be lived with. As already mentioned, the analog VGA-out disqualifies itself, due to its obvious unfocused representation at a resolution of 1280x1024 pixels. A significantly better quality should be possible over the digital interface (display port). However, we couldn't test this due to missing hardware. 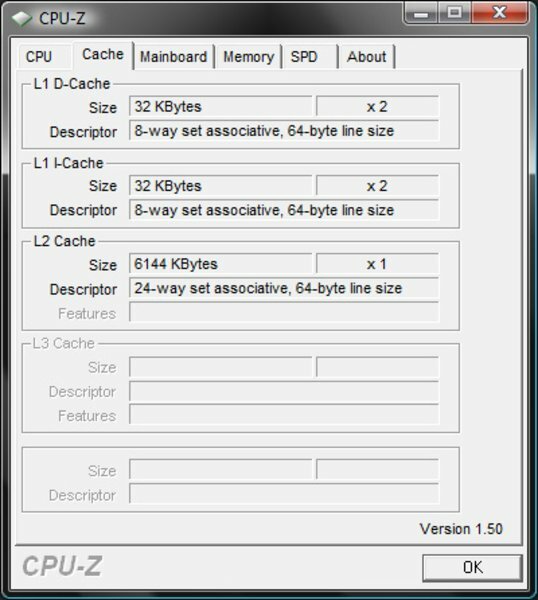 External resolutions of up to 2560x1600 pixels are also possible over this interface. 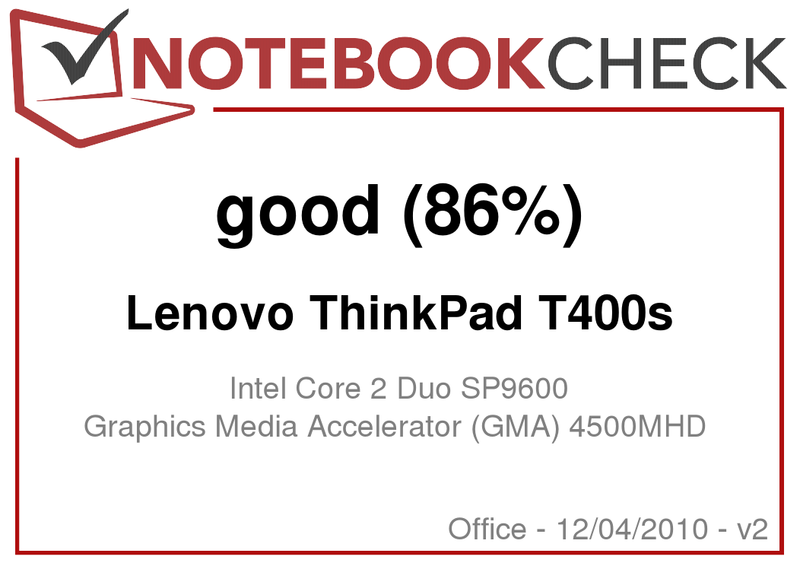 It's barely a wonder for a business notebook of this weight category that Lenovo uses the well-known Intel GMA X4500MHD to guaranty the graphic output. The selected solution with a relatively low power consumption paired with a target group suitable performance is predestined for the T400 of the slimline variation. As the integrated graphic unit doesn't have its own graphic memory it has to "borrow" this dynamically from the RAM when required. 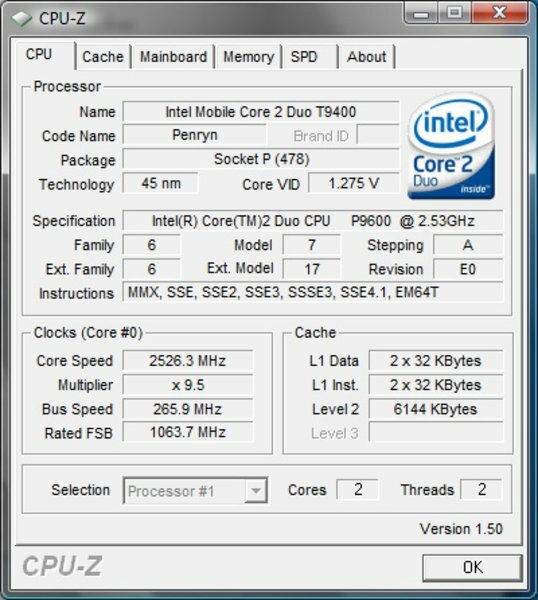 The graphic core is clocked with 475 MHz and has enough velocity for many applications. 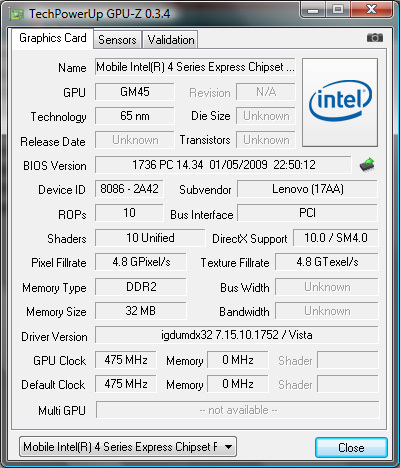 3D-prone and/or OpenGL based and, at the same time, demanding applications are as usual not manageable in this configuration and require an alternative with an accordingly more efficient graphic unit, as it might be given from the conventional T400 with an ATI Mobility Radeon HD 3470, for instance. The benchmark results with Intel's GMA 4500MHD are within the range of experience that we have made up till now. The system achieved 998 points in the 3DMark'06 and in the Cinebench R10 OpenGL Shading 1227 points. 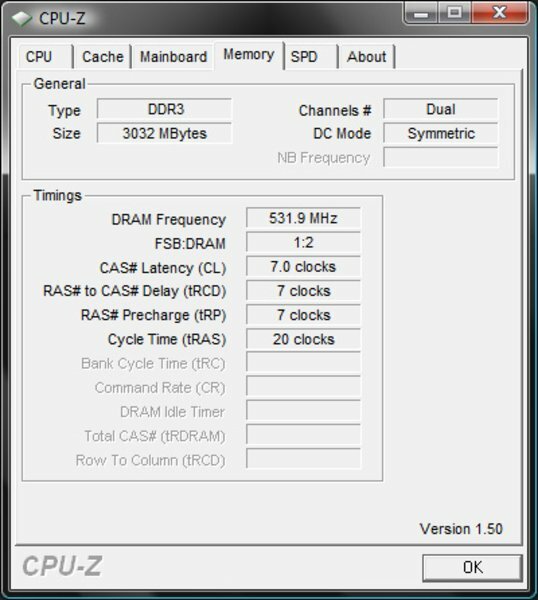 The Intel Core 2 Duo CPU SP9600 (25W TDP) is employed as the computing power station in our prototype, which has a clock rate of 2.53 GHz, aside from 6MB L2 cache and therefore is one of the more efficient options from Intel. A special feature is that this CPU is soldered directly onto the circuit board and makes a lower case construction height possible. Signs for the fast work are the SuperPi-32M-finish in 1117 seconds, 23240 MiPs in Sisoft's Dhrystone and 18549 MFlops in Sisoft's Whetstone benchmark, amongst other things. Those are very good values, which don't usually awake the necessity of a call for more performance so fast. 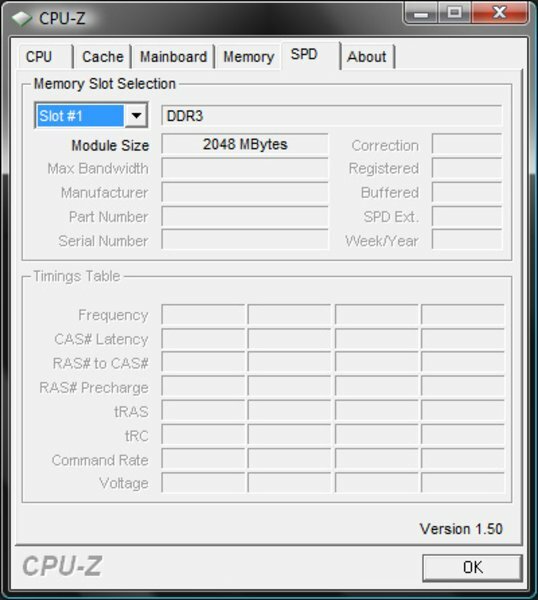 Additionally, a waiver on performance in the memory sector isn't to be expected with 4GB DDR3 RAM (of which only about 3.1 GB can be called upon due to the applied 32 bit operating system) and a 128 GB SSD from Samsung. This is also reflected in the results of PCMark'05 (7587 points) and PCMarkVantage (total: 5816 points), which are responsible for the assessment of application performance. The very fast Samsung SSD, which reached an average reading transfer rate of 164.3 MB/s in the HDTune hard disk benchmark, isn't completely innocent in this matter. This is an incredible performance boost of 100%! in comparison to common notebook hard disks. The only problem is the comparatively short in supply memory capacity of about 108 GB net. Image editing, word processing, spreadsheet, communication and browser programs can be executed without problems in practice. Even CPU-prone converting in the audio and video field can be dealt with fast enough. Rendering FullHD material studder-free and without breaks was successful with the Intel X4500MHD with use of a dxva-capable video player (e.g. Cyberlinks Power DVD) with activated hardware acceleration. In any case, the system has enough reserves for the rendering of our iTunes H.264 movie. It played the iTunes test movie "Shooter" (853x354) just as smooth as the movie "Seven" (754x322), which we converted into a H.264 format. Itunes MP3 could be converted to AAC files with an average of 26.6fold velocity. 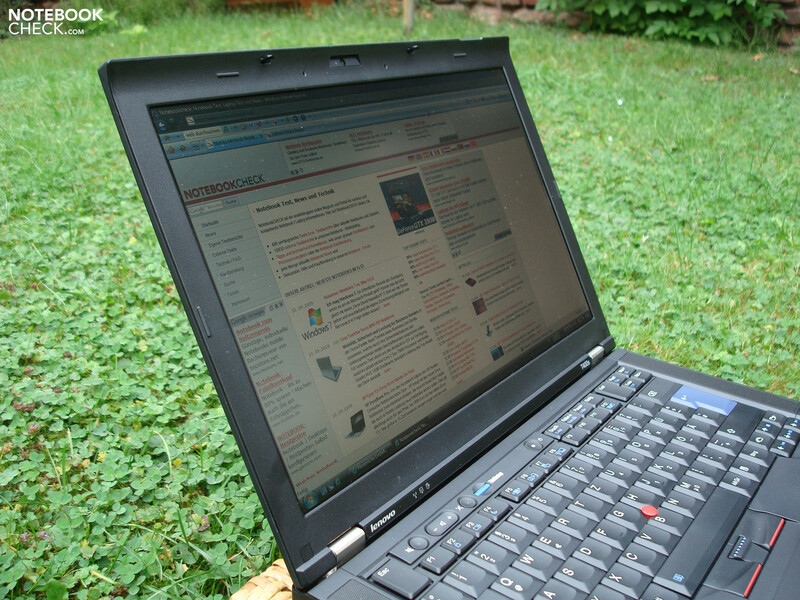 These results show that the ThinkPad T400s is an agreeably fast working-machine, which is even suitable for the one or other multimedia distraction. A vital part of every notebook is also the connectivity for connecting external peripherals. 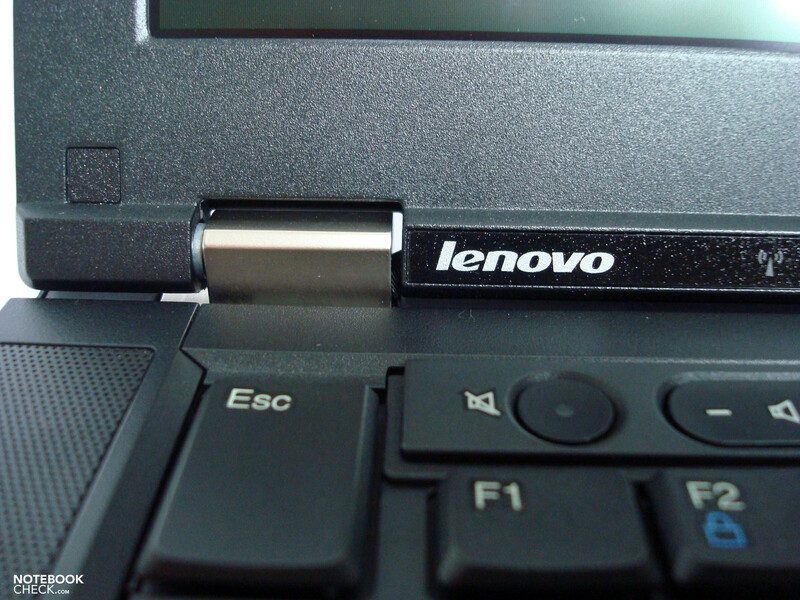 Lenovo bids several options for data exchange with 2 USB 2.0, a cardreader and a combined USB 2.0/eSATA connection. Particularly the eSATA port is very useful for connecting fast external hard disks. 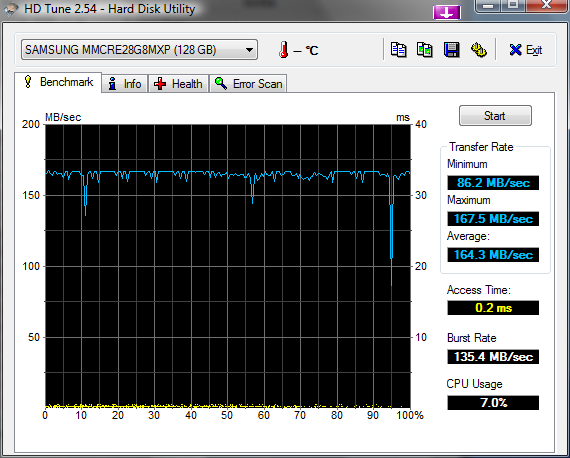 With our test model, we reached a maximum of 20.2 MB/s with a OCZ 2GB SD card, max. 19.6 MB/s with a SanDisk Extreme III SDHC card, 27.3 MB/s at the USB port and 67.8 MB/s at the eSATA interface. These aren't top values, but are in the upper center span and should be sufficient for most mobile scenarios. The Matshita DVD drive does seem to have a few problems with scratched or slightly dirty DVDs. Whilst 2 test DVDs absolutely refused to run in the internal drive and provoked an infinite reading loop, they could be played in an external Samsung SE T084 DVD burner without further ado. 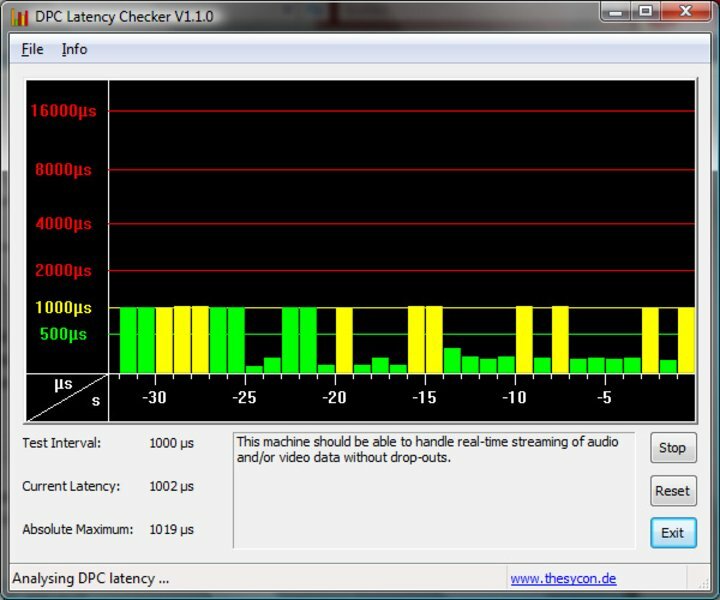 With the DPC Latency Checker tool, we also checked the latencies with windows. These were mostly within a limit and reached a maximum of 1000 µs. Therefore, there shouldn't be any problems with the synchronization of external devices, such as for instance soundcards. 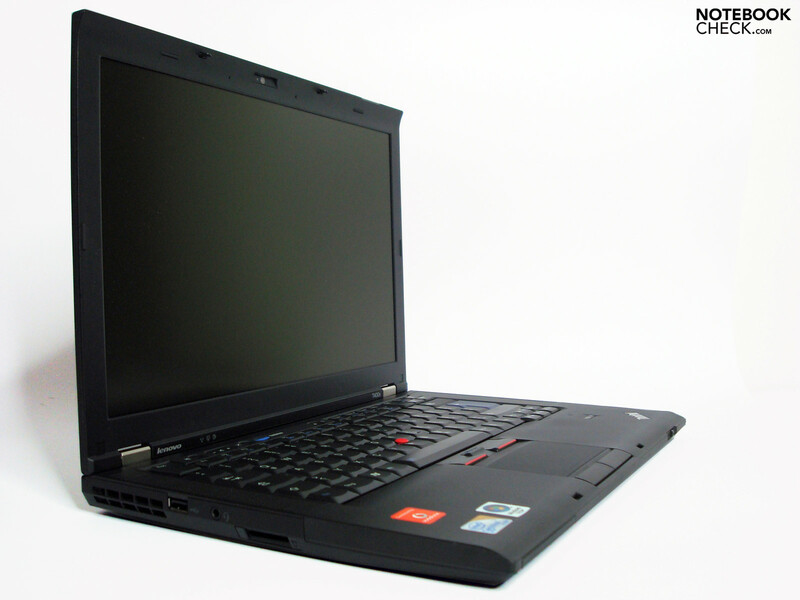 Basically, the T400s is, like known from most ThinkPads, a very quiet contemporary. It wasn't even noticed that it was operating with a silent 29.6 dB(A) in idle mode. Primarily, it only becomes noticeable when the mass memory (SSD) is accessed, which causes a still very quiet "whirring" of 30.1 dB(A). DVD rendering remained within a tolerable range with 37.6 dB(A); data DVDs are significantly more unpleasant with 45.2 dB(A). In return, the established 36.8 dB(A) under load could be tolerated for a longer period without causing an uneasy feeling. The fan characteristic is always very even and balanced and doesn't cause any emphasized disturbances. A high frequent "buzz" originating from the area of the wireless module proved to be quite a nuisance. It comes out of the keyboard's center area and gets very obtrusive, especially in a quiet surrounding. Deactivating the module is a remedy, but isn't always possible because of the resulting loss of connectivity. We can't say if this is a peculiarity of our prototype, as we haven't any possibility of comparison. Whilst the entire notebook is always pleasantly cool on the right, the case temperature on the left, particularly in the louver area, can get a bit disagreeable with a maximum of 48.4°C on the upper side and 42.6°C on the bottom side at some points. There should practically be no limitations, as this is restricted to a small area, turns up after about 1 hour of full load and otherwise barely exceeds the normal human body temperature. In opposition, the values reach a maximum of 31.6°C on the bottom side and remain under the 30°C mark even after 2 hours of use in maximum energy savings options. (±) The average temperature for the upper side under maximal load is 35.1 °C / 95 F, compared to the average of 29.4 °C / 85 F for the devices in the class Office. The 2x1 watt loudspeakers have been placed very obviously left and right of the keyboard. They bid a strong midrange, as known from business notebooks, but the lack of bass and dominant trebles lead to a very unbalanced sound. Additionally, the somewhat low maximum volume could prove to be insufficient for presentations in larger rooms. The best would be to take a pair of low-priced USB loudspeakers (in stationary use) or headphones right away to have a ready solution for any upcoming situation. The base for the possible battery runtimes are, on the one hand, the system's power consumption, and on the other the battery capacity. 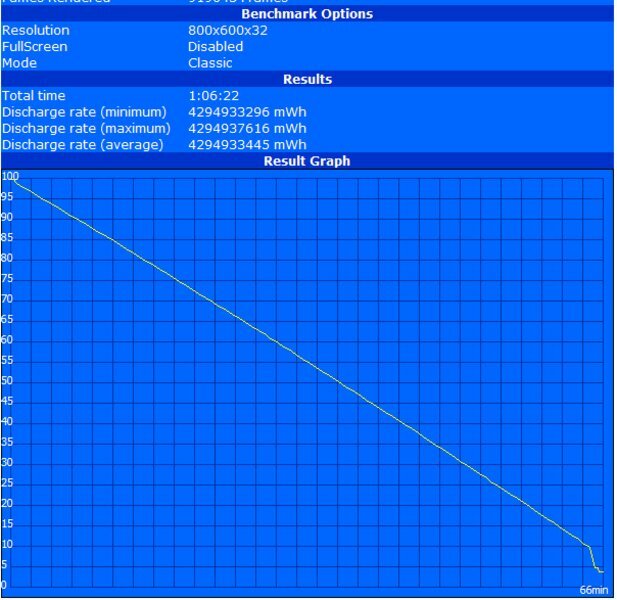 Whilst the standard 6 cell battery's storage charge turns out rather average with 44 Wh, the consumption data was more impressive. 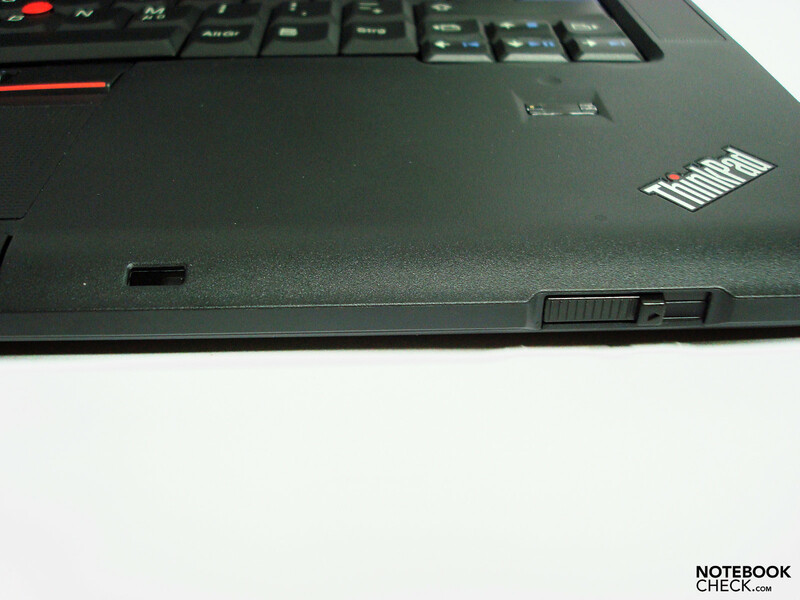 The ThinkPad was satisfied with a modest 8.9 watt power consumption in Lenovo's Energy Star profile and can compete with many netbooks. Also in idle mode, but in the high performance at full brightness and activated consumers, the consumption increases to a still good 17.5 watt. All restrictions are abandoned under full capacity and the system takes a good portion from the energy storage with 49.8 watts. 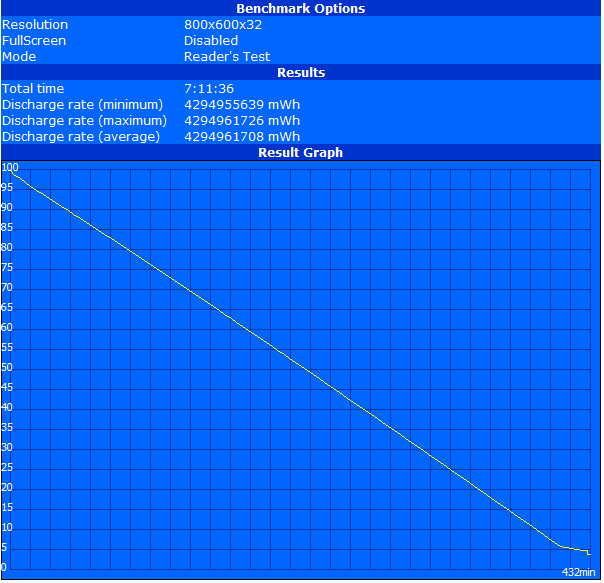 The test candidate reaches a flabbergasting 432 minutes of runtime in the BatteryEater Reader's test (maximum possible runtime with a dimmed display, energy savings profile). Lenovo's refined Energy Star profile is particularly responsible for this, as it simply turns off certain components, like e.g. the DVD drive and wireless modules. The impracticable display brightness, which we have also used for comparison reasons in this aspirant, contributes to this, as well. We still reached a good runtime of 198 minutes remote from the mains with adapted settings in practical WLAN surfing. With 154 minutes, the ThinkPad didn't quite achieve such a good time at DVD rendering but it should still be enough for most overlong movies. The BatteryEater Classic test (minimum runtime under load, all consumers on) shows, with a runtime result of 66 minutes, that a high system performance with a power consumption of over 48 watts has its price and can't remain independent of a power socket for long. The optionally available 3 cell Ultrabay additional battery can't remedy this much, either. Therefore, a such high performance scenario will be indicated more in stationary use and one of the more modest profiles will be favored at mobile use. 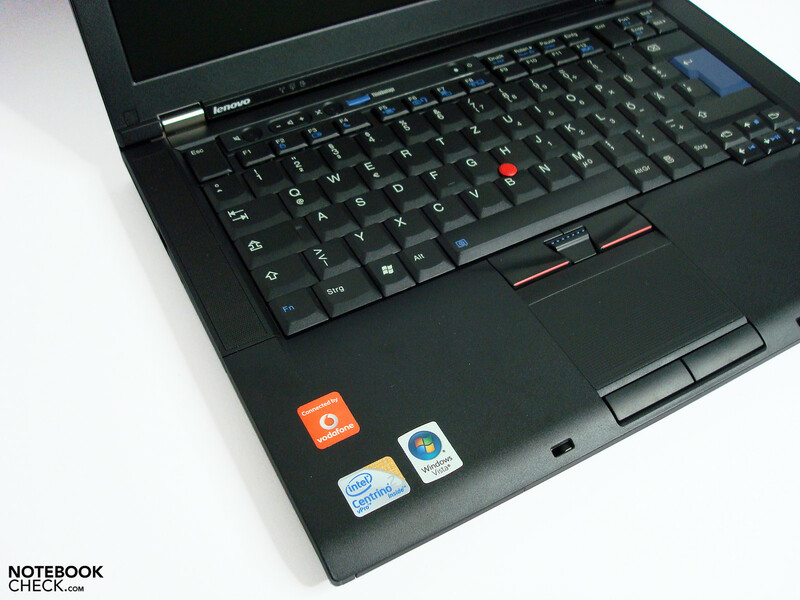 Lenovo has modified exactly the right things on the T400s and has achieved an incredible plus on mobility, particularly due the reduced weight. The multifarious connectivity fulfills almost every wish, as it bids all three current connection options in form of a UMTS modem, an eSATA and a display port, and won't only be of interest in the business client range. The display lid's stability and the keyboard don't quite have the usual quality level. The slightly altered keyboard layout might irritate a few accommodated frequent typists. However, the biggest weak points are found in the contrast poor display and the high frequent noise development, which probably originates from the wireless modules that turned up in the prototype. 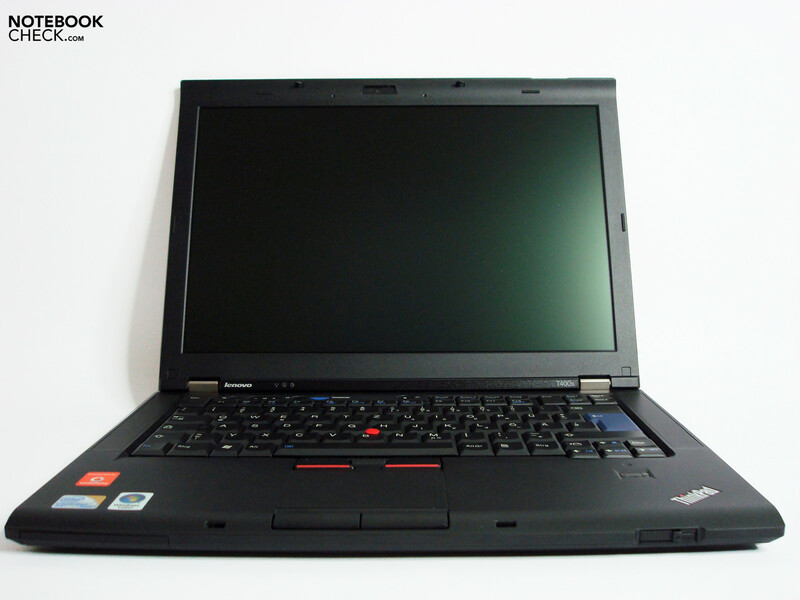 Basically, the ThinkPad T400s is a felicitous evolution stage that can impress with a very good application performance, manufacturing quality and configuration combined with an extremely low weight in a slim case. The only thing left is the fairly high surcharge in comparison to the conventional T400 variant, which has to taken bravely as the last drop of bitterness. Many thanks to Notebooksandmore.net who kindly provided us with the test device. You can configure and purchase it here, as well. The felicitous combination of a very good efficiency, low weight and flawless configuration. An overall good display and a silent wireless modem. That Lenovo has managed to save more than 500 g of weight in comparison to the standard T400 and barely had to make compromises in view of quality and equipment, anyway. The Acer Travelmate 8371 has good business traits with a lower computing performance but a similarly low weight and an extremely long runtime. 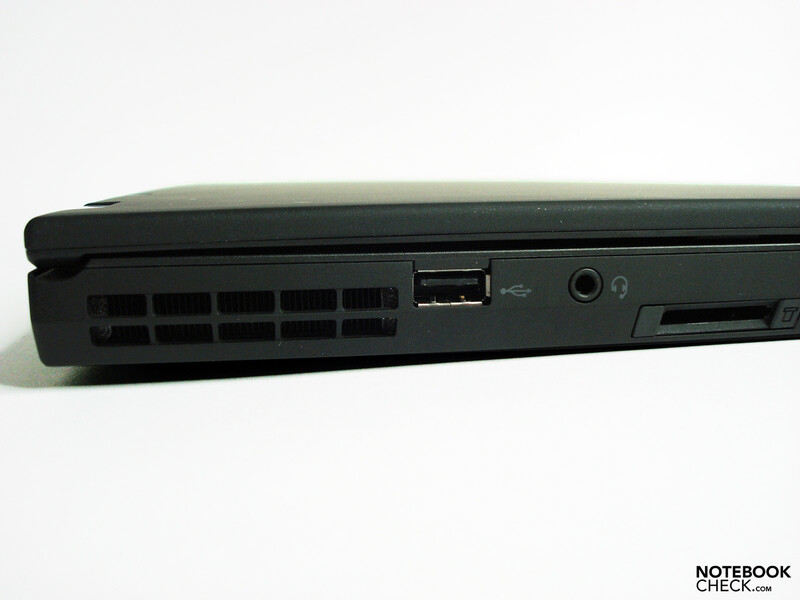 Otherwise, you might look at the HP 6530p, HP 6930p, FSC S7220, Dell Latitude E6400 and the conventional Lenovo T400 and R400. However, you have to make the one or other compromise in all alternatives.